Pitoresk Holiday Village is structured using traditional rocks which make it very authentic and special. It is situated in Besparmak Mountain range in the vicinity of gallant and beautiful castle of St. Hilarion. The vista of the deep blue Mediterranean Sea and mountain chain resembles a paradise on Earth. This holiday terminal is circumvented with amazing greenery, which makes the whole setup an exclusive package itself. The edifices are carved in typical Mediterranean style with local yellow rocks. Pitoresk Holiday Village offers a wide range of accommodative options to its guests. The cottages and rooms are fully equipped with comfort essentials like television, air conditioner, exotic bath tubs. Its roof top bar is a romantic place to relish your drink under the warmth of rising or sinking sun. It is a 10 minute walk away from town center, which is a humble place for shoppers. The Pitoresk Holiday resides at a hillside position which offers a tremendous panoramic view of Mediterranean Sea resting beside mountains. The combination of the hospitality and the genuine taste of Cypriot culinary art will overwhelm you to a great extent. 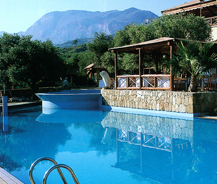 The Pitoresk Holiday is a stand out option to have an exclusive holiday in the heart of Besparmak Mountain range.